After a brisk sail north from Port Erin, Isle of Man, we arrived in Port Ellen, Islay, early afternoon 15 June. After passing Mull of Kintyre late in the evening on the 14 June we decided to hove to in the increasing southerly blow so we could enter Port Ellen the next morning in light and more favourable conditions. get sufficient wedges in the mast step to eliminate the disconcerting creaking of the mast as it shifted in its base (only a fraction of a millimetre but causing gut-wrenching sounds when it did so). reversing the fore frayed luff hauling parrel and placing shackles between the blocks and battens to increase allowable movement and eliminate chafing. I would also like to build some kind of fore sheet deflection so the fore sheets don’t get stuck on the side of the gallows when jibbing. Not sure if I have the materials at hand here but I’ll look around. I believe thin pvc piping bent in an arc would be suitable but might have to wait till we get to a more central town to purchase them. 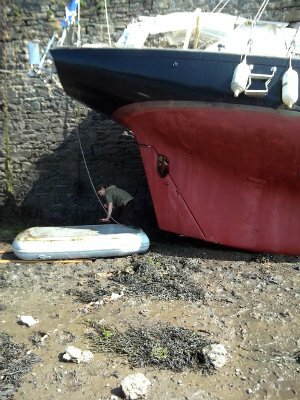 In the meantime I will simply have to be mindful when jibbing and prepared to go up to the fore deck to disentangle the fore sheet if they get jammed on the side of the gallows. Regarding the main sail, it has a considerable amount of twist at the leech despite an even distribution of force. (You can view the twist in the video short embedded below – although it seems more acute in real life than on film.) 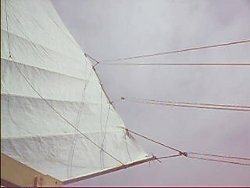 The lower sheet parrel seems to exert the most force making the foot of the sail too far inboard, (or the top of the sail too far outboard), when the sheet is eased. Currently the first pull is from the bottom and I have reversed that order to the top. We’ll have to see if that helps reduce leech twist on our sail north tomorrow. The best natural anchoring spot in the harbour, probably used for over a few thousand years, has now been taken over my a dubious “not-for-profit” oufit (see malinwaters and portofellen) who has installed a small pontoon marina over it charging extortionate rates for a berth for very little service in return. We initially anchored in off to the side of the channel but were later approached by a ferry official saying that there was no anchoring allowed in the area as we would be in the way of ferry manoeuvres. As far as I can gather it was a lie based on the obsessive need to control others – a common trait of a petty bureaucratic mind, but not wanting to get in a hassle we picked up our anchor and moved to the north side of the pier and haven’t been bothered since. There is a laundry here but they won’t let you wash your own clothes and charge £10 to do it for you. No thanks :(. Hand washing in buckets is far more preferable :). Internet café charges £1 for each half an hour you access their connection – on your own laptop! They charge even more if you want to use one of their computers. Thankfully we have mobile dongles that can connect ;). Planning to head off tomorrow morning and go northbound up the Islay / Jura channel up to the delightful (hopefully) island of Colonsay.